Kirsi Stjerna, a native of Finland, is a Lutheran theologian engaged in critical and compassionate examination of the relevance of Luther's freedom theology for the contemporary world. 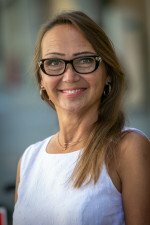 Educated in Helsinki University, Finland, with the late Tuomo Mannermaa and in Boston University with Carter Lindberg, she has broad interests in the Reformation scholarship and with the sources in Christian theology. Her book Women and the Reformation (Wiley 2008) broke new ground by bringing women's theological voices to the conversation. Her most recent work has focused on Luther's theology and purging it from its anti-Jewish ingredients. The Annotated Luther, Vol. I-VI (Fortress, 2015-2017) was a major undertaking that saw its completion in the Reformation anniversary year. First Lutheran, Los Angeles/Southwest California Synod Professor of Lutheran History and Theology, Chair, Pacific Lutheran Theological Seminary, Berkeley. 2015-ongoing. Core Doctoral Faculty, Graduate Theological Union, Berkeley: Theology, Spirituality, History. 2016-ongoing. Docent, Theological Faculty, University of Helsinki, Finland: History of Christianity and Gender; Theology and Luther. 2014-ongoing. An ordained pastor of the Evangelical Lutheran Church of America and of the Evangelical Lutheran Church of Finland. 1989-ongoing. Professor of Reformation Church History, with tenure, Lutheran Theological Seminary at Gettysburg, PA. 2010-2015. Associate Professor of Reformation Church History, LTSG, with tenure. 2006-2010. Assistant Professor of Reformation Church History, LTSG. 2000-2006. Associate Director for Theological Studies, Division for Ministry, Evangelical Lutheran Church in America. 1999-2000. Dialog: A Journal of Theology. 2013-ongoing. FSCIRE = Fondazione per le scienze religiose Giovanni XXI. 2015-ongoing. The Desire for Christian Unity, Italy. Fscire. 2017-ongoing. The Encyclopedia of Martin Luther and the Reformation. Rowman and Littlefield. 2015-2017. Luther: A Christian and His Legacy, 1517-2017. UTET, DeGruyter. 2015-2017. The Annotated Luther. Co-General Editor with Hans Hillerbrand and Timothy Wengert. 2015-2017. Featured in the PBS documentary "Martin Luther: The Idea That Changed the World" (2017). Married to Rev. Dr. Brooks Schramm, Professor of Biblical Studies, Kraft Chair, at United Lutheran Seminary. Boston University Graduate School, Division of Religious and Theological Studies: Doctor of Philosophy: Religious and Theological Studies, 1995. University of Helsinki, Department of Theological Studies: Master of Theology: Systematic Theology and Ecumenics, 1988. Pontifical University of St. Thomas Aquinas in Rome, Department of Theological Studies: Visiting scholar: Ecumenical, Feminist and Spiritual Theology, Fall 1989. Lyseon Lukio College/High School, Mikkeli, Finland: Equivalent of Bachelor of Arts Degree, 1982. University of Helsinki, Faculty of Medical Studies: Studies in Psychiatry and Clinical Psychotherapy Training, 1988-1989. Languages: English and Finnish. Swedish, Italian and German. Latin. Studies in Greek and Hebrew. Beginning studies in Spanish. PBS Documentary, "Martin Luther: The Idea that Changed the World", 2017. Luther and the Subaltern. A Symposium, Skaholt, Iceland, May 31-June 3, 2018. Presenting: "Luther against Luther: Anti-Semitism and Racism vis-à-vis Luther’s Freedom Theology." Conference Churches Against PopulismChurches as Agents for Justice and Against Populism. Public Theology in Global Intercontextual Dialogue. Lutheran World Federation, Svenska Kyrkan, Evangelische Akademie in Berlin. Berlin, May 2-4, 2018. Presenting: “Roots of Persistence: Reformation against Sexism”. Adult Forum at St. Johns Presbyterian Church. Berkeley, CA. April 29, 2018. Presenting: “The Reformation Mothers of the Reformed Tradition”. Luther, the Jews, and the Bible. Hunter College, New York. April 24, 2018. A symposium with Visnu Adulri and Brooks Schramm. Presenting: “Luther and the Jews in his world”. Passion and Persecution: The Music of Bach, the Gospel of John, and Religious Intolerance. Google Community Space, San Francisco, April 8, 2018. A community discussion organized by San Francisco Bach Chorus. A panel with Tom Hall, John Efron, and Jonathan Sheehan. Luther Lecture at PLTS. Berkeley, CA, March 8, 2018. “Luther Against Luther.” Scripture and Christian Anti-Semitism. Past Realities and Future Remedies”. Keynote and Roundtables with Brooks Schramm. An Inter-Religious Panel at CLU. Thousand Oaks, CA, March 5, 2018. Planning and participating in a public discussion on the ELCA statement on Inter-Religious trajectories for the future. Boston College the Corcoran Chair Conference. Boston College, Mass, March 25-26, 2018. “Luther’s Anti-Jewish Interpretation of the Bible: A Case Study in Christian-Jewish Relations in Late Medieval Germany.” Presenting: “The Luther’s Jesus Christ Was a Jew”. The Forgotten Luther II Conference.Washington, D.C. January 19-20, 2018. Lutheran Church of the Reformation, Capitol Hill, D.C Presenting: “A cautionary tale: Luther and the Jews, and rejecting anti-Semitism”. American Academy of Religion, 2017, Boston, Mass. Martin Luther and Global Lutheran Traditions. Moderating and Responding in two panels addressing the Reformation 500th anniversary and the relevance and urgencies of the reformation theologies for the future, globally speaking. Fairfield University, Center for Judaic Studies/Center for Catholic Studies, Connecticut. October 25, 2017. Keynote: "Luther's Christ was a Jew - Implications." Ohio State University, Symposium: Reformation and Remembrance. Ohio State University, October 20-21, 2018. With Merry Wiesner-Hanks, Alexandra Walsham, James Simpson, Ralph Keen. Presenting: “Remembering Eve in Martin Luther’s Theological Imagination”. California Lutheran University Convocation Address. Thousand Oaks, CA, October 13, 2017. “Reforming, Then and Now”. Association for Lutheran College Professors, Thousand Oaks, Ca. September 29, 2017. Keynote lecture: "Reformation and Education - Then and Now." International Luther Congress, Wittenberg, Germany. July 31 - August 6, 2017. Seminar leader with Else Marie Wiberg Pedersen, "Luther on Women/Luther and Women". United States Holocaust Memorial Museum, D.C. June 19-23, 2017. Teaching a faculty seminar on "Luther and the Jews", with Brooks Schramm. Society of the Holy Trinity, Spring Retreat, St. Benedict, Oregon, 5/24-25, 2017. Presenting: "Mothers of Faith, Women and the Reformation." Theological Seminary Saskatoon Annual Study Conference. Saskatoon, Canada. May 2-4, 2017. Three lectures: "Dashed Hopes and Dark Sides of Luther's Reformation." Pacific Coast Theological Society, February 21-22, 2017, Berkeley, CA. A public lecture: "Luther's Theses and Freedom Theology." Faith Lutheran Church, Castro Valley, CA, 4/26, 2017. Presenting: "Women and the Reformation." Concordia Lutheran University, Austin, TX, 4/10, 2017. Presenting: "Women and the Reformation." Westar Institute of Theology, St. Rosa, CA, 3/22, 2017. Presenting, two lectures: "Luther for the Future." "Gender and the Reformation." Luther and the Subaltern. A study symposium, PLTS, Berkeley, March 9-11, 2017. Co-hosting and presenting: "Gender and Luther." Fartsrup-Mortensen Lectures, Solvang, CA, 2/24-26, 2017. Presenting: "Luther for Today, Freedom Theology," "Luther's Core Theological Insight - Dancing with Law and Gospel," "Luther and the Reformation Mothers", and panels. Nordic Spirit Symposium, Thousand Oaks, California, February 10-11, 2017. "All Power is of God. Reform in Sweden and Finland". Presenting: "Reformation in Finland: Commitments to Education, Welfare, and Culture". Stanford Primary Source Symposium. November 10-13, 2016. Center for Medieval and Early Modern Studies at Stanford University, CA. "Reformation Theology in the Hands of Argula von Grumbach." Ritualizing Environmental Change, Re-thinking Religion. October 23rd, 2016, Doug Adams Gallery. Interdisciplinary Panel with GTU faculty –Dr. Rita Sherma and Dr. Robyn Henderson-Espinoza - and REDO scholars, moderated by Dr. Devin Zuber. Grace Gathering, Freed & Renewed in Christ. ELCA. New Orleans, LA, August 13-12. Workshops: "Women and the Reformation" (twice), and "Large Catechism and Luther’s Freedom Theology." Luther500. Conference on Theology of Martin Luther. Melbourne, Australia, June 28-July 3, 2016. Lecture: “Luther for the Future”. Lay School of Theology, Chippawee Falls, WI, 4/8-9. 2016. Seminar, with Brooks Schramm: "Luther and the Jews." Sierra Pacific Synod, Retired Pastors' Retreat, San Damiano, CA, 2/22, 2016. Three lectures: "Luther and Spirituality," "Luther and Women," "Luther for the Future." Luther's theology and spirituality; feminist and gender approaches; and the Finnish Luther School. Lutheran theology, sources, and hermeneutics with contemporary concerns for freedom, equality, and justice. Luther and the Book of Genesis, especially the creation and the fall of Eve. Women and the Reformations/Reformation theologies and histories with gender perspectives. Lutheran: Sacramental theology and baptism; Anthropology and sexuality. Protestant Reformations, foundational texts, and gender perspectives. Lutheran Theology: Sources and Hermeneutics. In progress, forthcoming, 2020. By Heart: Conversations with Martin Luther’s Small Catechism, co-authored by Guy Erwin, Mary Jane Haemig, Ken Sundet Jones, Martin Lohrmann, Derek Nelson, Kirsi Stjerna, Timothy Wengert, Hans Woersma. Minneapolis: Augsburg Fortress, 2017. Encounters with Luther, New Directions for Critical Studies (Westminster John Knox, 2016), edited with Brooks Schramm; with an article "Luther on Marriage: Gay or Straight". The Annotated Luther, Vol. I-VI. General Editor with Timothy Wengert and Hans Hillerbrand. Essential Luther’s works with revised or new translations, new introductions and annotations. Fortress Press, 2015-2017. Contributions: Volume Editor for Volume 2, Word and Faith. September, 2015. Work with Volume 6, ed. Euan Cameron, 2017. Contributor: Luther's Large Catechism (Vol. 2), That Jesus Christ Was Born a Jew (Vol. 5), Luther's lectures on Genesis 2 , and Luther's Galatians commentary (Vol. 6). The Large Catechism of Dr. Martin Luther, 1529: The Annotated Luther, Study Edition, from the Annotated Luther. Fortress Press, 2016. On the Apocalyptic and Human Agency: Conversations with Augustine of Hippo and Martin Luther. Eds. Kirsi Stjerna and Deanna A. Thompson. Cambridge Scholars Press, 2014. Martin Luther, the Bible, and the Jewish People, with Brooks Schramm. Minneapolis: Fortress Press. August, 2012. Reformaation Naisia (Women and the Reformation). Helsinki: Kirjapaja, 2011. “No Greater Jewel:” Thinking of Baptism with Luther. Minneapolis: Augsburg Fortress, 2009. Women and the Reformation. Wiley Blackwell, 2008 (translations in Finnish, Korean, and German). Martin Luther: A Christian between Reforms and Modernity, ed. Alberto Melloni et al. The Oxford Encyclopedia of Martin Luther, ed. Derek Nelson and Paul Hinlicky. The Cambridge Handbook: Martin Luther in Context, ed. David Whitford. The Dictionary of Luther and the Lutheran Traditions, ed. Timothy Wengert et al. Encyclopedia: Martin Luther and the Reformation, ed. Mark Lamport. “Part III: The Reformation Period (1500-1600)”, eight chapters. Reading Christian Theology in the Protestant Tradition, 315-458. Ed. Kelly M. Kapic and Hans Madueme. T&T Clark, 2018. Articles and Chapters: see c.v.
Association for Theological Schools, Theological Scholars Grant, 2004-2005, "Women and the Reformation". Association for Theological Schools, Theological Scholars Collaborative Research Grant with Dr. Brooks Schramm (LTSG), 2010-2011, "Luther, the Bible and the Jewish people". The Sachem Title VI Grant, 1997, "Internationalizing the Curriculum - Ancient History". Scholarship of Merit, 1990-92, Boston University. Chamberlain Herman Rosenberg Research Fellowship, 1990-93. The Finnish Academy Research Grant, 1990-91. Grants from the Finnish Women's Science Foundation, the Culture Foundation, and the Finnish-Swedish Culture Foundation, 1990-1991.